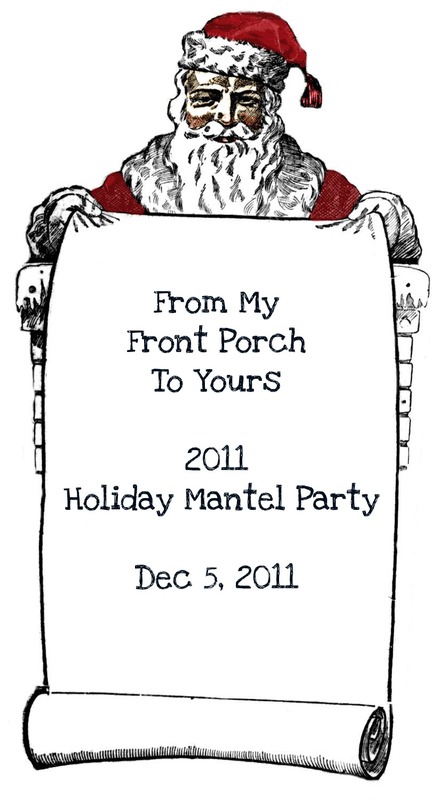 Welcome to From My Front Porch To Yours First Annual Holiday Mantel Party! I am so excited to have y'all over that I decided to start the party early!! I have been busy getting ready for y'all. I had changed out our mantel display last year so I pretty much just kept it the same since I liked it so much. Our stockings are from Pottery Barn Kids. I got them on clearance for just $7 each about 5 years ago. There is even an extra put away just in case there is ever an addition to the family! ;) I have yet to bring myself to have our names embroidered on them so last year I found these gold glitter initials at WM for just $1! I started collecting Mark Roberts Fairies quiet a few years back. My mom gives me one every year for Christmas and I can not wait to see which one she gave me this year. The berry trees in pots I purchased in the after Christmas clearance isle at Target abt 6 years ago for only $12 each! 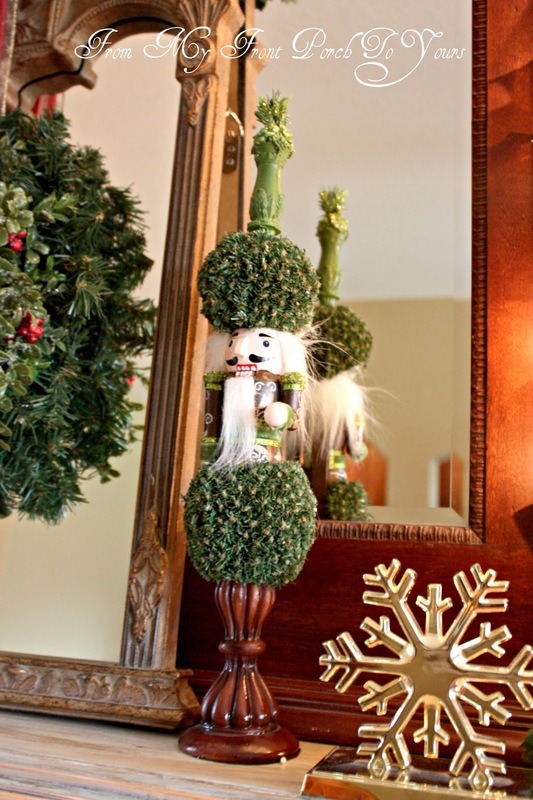 My topiary Nutcrackers are from Cracker Barrel two years ago. They were only $12 a piece which I think was a good price. Our hearth is what changed the most this year! The black granite surround is gone. We replaced it with porcelain tile this past spring that looks like rock. I LOVE it! We also tore out our carpet and replaced it with Antique Oak Engineered wood flooring. Saint Nick rests on his chair by the fireplace. He is a Cracker Barrel find from several years back as well. When I was looking at pics from last year I noticed there was an empty spot here under the stockings. How I missed that I do not know. This year I filled it in with some empty frames and an architectural finial all of which I already owned. Our fireplace display has evolved thru the years...my photo skills as well!;).... as pieces have been purchased but all at incredible deals. This is our mantel back in 2009. This was our mantel last year in 2010. You really can achieve beautiful Christmas displays on a tight budget but you just have to be patient and know it may take a few years before you achieve the look you have longed for. I think I have finally reached the look I have always wanted! Thanx for coming by to my party! I know there are so many parties out there and we are all so busy. I am truly thankful and honored you stopped by! If you get a chance grab my button off the sidebar and invite all your friends! The more the merrier! Now on to the party! 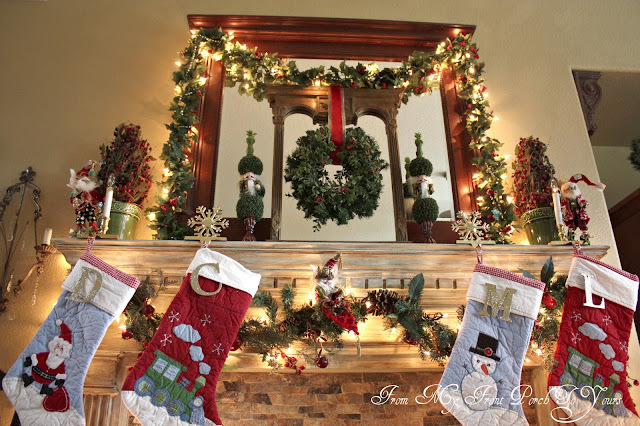 I can not wait to see y'alls mantels and holiday displays! As with all parties there are the normal rules. You must link back to From My Front Porch To Yours in your post and not just on your side bar. Just common courtesy. If ya don't link back ya don't get to party. Only link up to your Holiday Mantel Party post and NOT your blog homepage. Please no advertising and please no more than three links from the same party goer. Also be sure to visit at least the link before you and after you to just say Hi! It makes partying all the more fun! P.s. Stay on the look out for an upcoming giveaway and another exciting announcement! your pictures are beautiful! Your mantel and everything looks amazing. I'm keeping my decor pretty simple this year, but I'm going to get some inspiration from your party and maybe get some more things out the next couple of weeks. I did take some pictures of the tree but they did not turn out great because my front living room has no overhead lighting, and there is no good natural light today. You are so right about being patient and collecting things you like over time. It really is a more natural and affordable way to get the look you want. 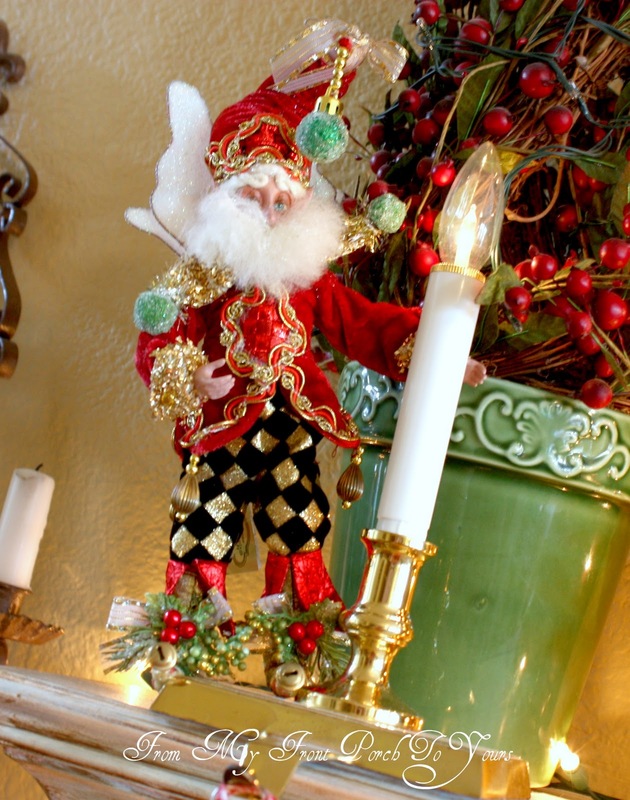 Your mantel decor is just lovely overall and with so many interesting parts. 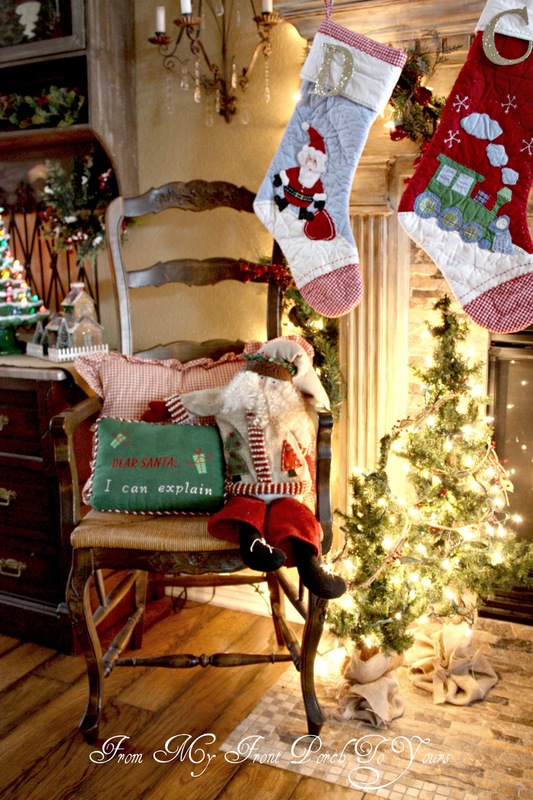 Of course the gorgeous tile work and mantel, and then down to the elements like the cute stockings. I think my favourite little part would be the empty frames with the wreath. Very pretty! Thanks for sharing. Oh and our mantel is STILL a work in progress. We have some boards up but need some special cuts so I don't want to rush it just for Christmas. Too much stress that way. Your mantel looks amazing! Thanks for hosting! So gorgeous Pam! You really have quite a knack with decorating mantles. I loved all of your previous ones as well. I also noticed your new fireplace surround. Gorgeous redo on that! Thanks for hosting such a fun linky! Thank you for being a gracious hostess! I am delighted to be able to take part! Many thanks! Stunning, Pamela! Your mantel looks so beautiful! I love your Mark Roberts fairies. I've coveted them for a long time, but haven't brought myself to buy one yet. Maybe I will ask hubby for one as a Christmas gift and he can start a new tradition! I'll be linking up my mantel tomorrow night. Thanks for hosting your mantel party ~ and for sharing your mantel. 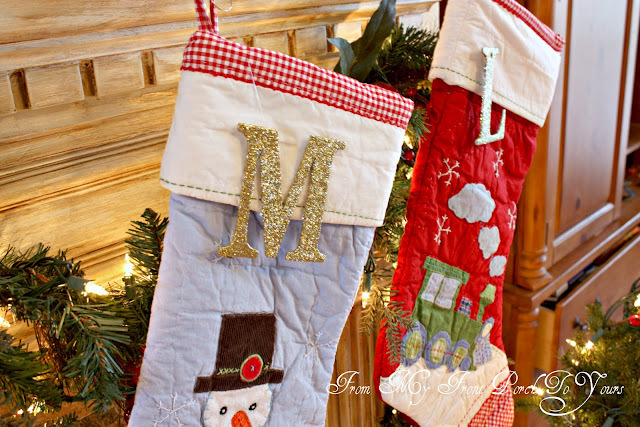 You've done a beautiful job, and I think it's a great idea to hang the initials with the stockings. Pamela, your mantel looks so good. I love the topiary nutcrackers. How did I miss those at Cracker Barrel. We go almost once a week. I'll be joining tomorrow. Looks absolutely beautiful Pamela. I just love all your touches, the picture frames are super cute too. Thanks for hosting. Beautiful, Pamela, and thanks for hosting. You already know how jealous of your new fireplace I am. My fave is the topiary nut-crackers. I just may have to look for some of those. Thank you for hosting! Your mantel is so pretty. Could I please have that chair for Christmas....pleeeeeeease? I adore it. And the little elves...so cute. Really, really pretty! Gorgeous Mantel and hearth, I love how it has evolved! Could u remove number 31? I am 32 now, couldn't get 31 to work right for me. Your mantel is outstanding! I really mean that! I adore the nutcracker topiaries, especially because I have a nutcracker mantel this year. Love what you have done with your fireplace place and floor. The fairies too! You have beautiful pieces. I love it all! Pamela, your mantel looks amazing! It's so beautifully colorful ... full of Christmas joy! I love all of the layers ... especially the picture frames on the hearth ... perfect idea! You truly did an incredible job! Thanks so much for hosting ... I'm off to mingle. Your mantel is beautiful Pamela! Love the topiary nutcrackers. I hope to get my mantel post up so I can join the party! Pamela, your mantel is just beautiful. I love all of the different elements you incorporated! It looks so warm and festive! Thanks so much for hosting this great party!!! Thank you so much for hosting! Your mantle is gorgeous! Your mantel is just beautiful! No wonder you didn't change much from last year. 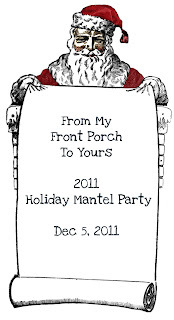 I linked up to your party, and I can't wait to see everybody's mantels. Thanks for hosting! Very pretty, love the topiaries and the stockings are so cute.Thanks for hosting. Wow, love your mantle and all that surrounds it! Absoultely beautiful!!! Your mantle is stunning...I love the hearth. I don't have a mantle (insert pouting)...so I will just enjoy yours!! Thank you for hosting this mantel party! Your mantel is lovely! I love the additions you have added each year! Your new flooring looks amazing! I know you'll enjoy it for years to come! Thanks for providing such Christmas inspiration and joy! Hi Pamela, your mantel is stunning....truly lovely and so festive. Thanks hosting such a fun party. The mantel is gorgeous, Pam. I Love the fairies and the topiaries are adorable. Beautiful!! Your fireplace remodel looks fabulous and the tile is wonderful. It lightens up the entire room. Thanks for hosting. 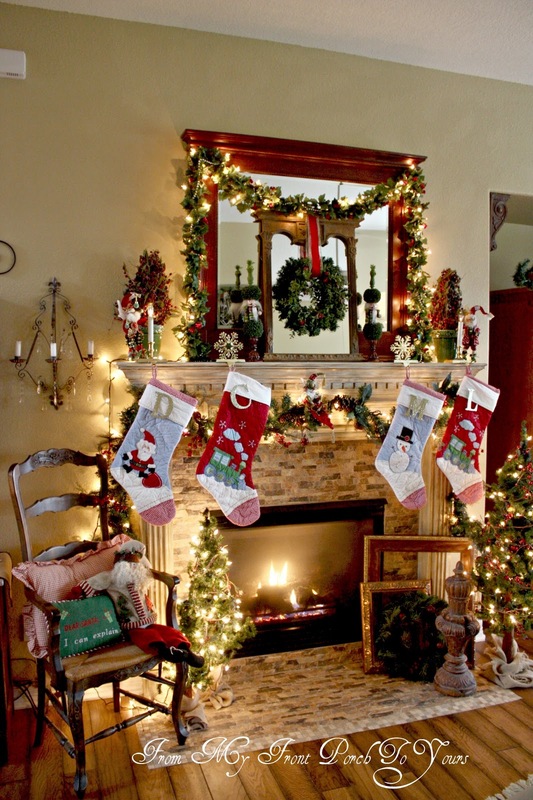 Your mantel is so beautiful and festive that I cannot stop staring at it! I love all the lights and all the colorful details! Just gorgeous! Thanks for hosting today - I am your newest follower! Your gorgeous mantel and hearth is truly magazine worthy! Thanks for hosting!! Pamela, I am finally linked up. Thanks for hosting. Your fireplace just glows! I love that new surround and the wood floors! Gorgeous! Cute decorations too! Thanks for having us over! I linked up with your little shin-dig, but you really set the bar high! Your mantle looks amazing! I love those frames and that finial on the hearth. You are a girl after my own heart! I love the changes you made in your room, everything looks lovely! Your photo skills have come a long way-I sure could use some tips!! Wonderful job, get some hot chocolate and enjoy the scenery! Thank you so much for hosting -- I just linked up and am looking forward to checking out every post. 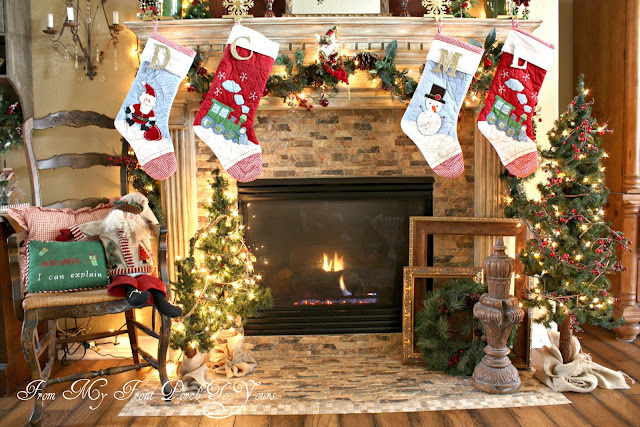 Your own mantel looks terrific, and I love the cute stockings. Your mantel is gorgeous, Pamela! It looks like something out of a magazine, truly! Mine is very tame in comparison, but I like it -- just happy to have a fireplace with a mantel....lol! Thanks so much for hosting this lovely party. Your mantel has evolved beautifully. It was great last year but this year, you took it over the top. My friend, your mantel is soooo beautiful! So charming and filled with Christmas magic! I love your Christmas fairies! What a fun collection to have! I also really like the topiary nutcrackers...very pretty and so unique! I've never seen any like them and would love to have one! 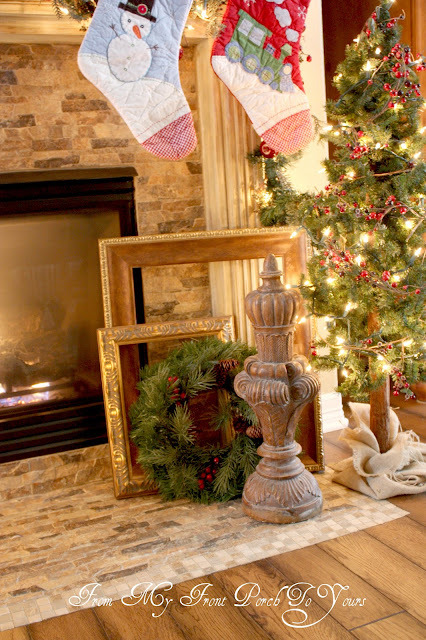 I think your Christmas hearth is just as gorgeous as the mantel too! I love how you stacked the frames...beautiful! Thank you so much for sharing your beautiful Christmas mantel with us...and for hosting this lovely party! I'm so glad that I could join in the fun! Wow, oh, Wow! First off, your fireplace and floors are beautiful. 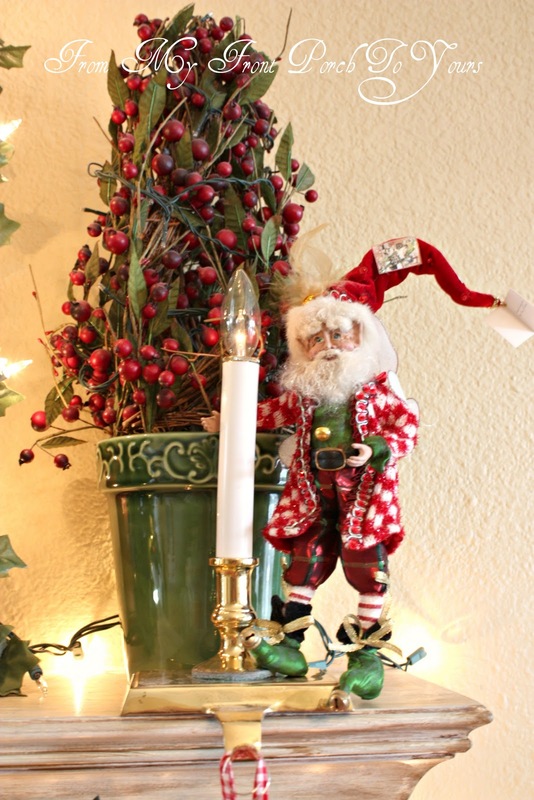 The 2011 Christmas mantel is a show stopper. It is so warm, cozy and inviting. I just love it!!!! Thanks for hosting the mantel party. Fabulous! Thanks for hosting the party and I am a new follower. This is truly inspirational. Your pictures have certainly evolved over the years and your mantle looks like a Christmas card. Beautiful! Thank you for hosting. I am a new follower. I'm here! So excited to be linking up my mantel! Yours is just wonderful, I love how it's evolved over the years. Thank you so much for hosting the party! Thanks for hosting the party and letting me link up both my mantels. I also really enjoy picking stuff up at after holiday clearance to decorate with. Over the top gorgeous! I was coming over here to join the party and saw we did the same thing with the initials! Great minds think alike. ;) Thanks for hosting! love the new facade on the fireplace, and there's just something about the stacked frames that i'm really digging. and thanks so much for hosting, too! Everything is just amazing! I love the mirror with all the greens and the sweet chair just makes everything look so warm and inviting. Your mantel speaks traditional, homey and heartwarming. Wonderful! Thanks for hosting a great party! Thank you so much for hosting, Pamela. Your mantel is gorgeous. I love all the traditional colors and the fact that you encourage using things that you have and adding on little by little. Not overwhelming this way. Very festive! I love your fairies, and the frames with the finial is the perfect touch. I love your wood floor and it's hard to believe your new surrond is ceremic tile. This is my first visit to your blog - don't know how I could of missed it before, I am a new follower. Thanks for hosting.